Report by Rewheel showed Americans already have the most expensive mobile data among all four-operator markets. A move to reduce the number of them could make it worse. According to the 2H2018 release of its mobile data price monitoring report, the Finland-based research firm Rewheel focused on the US market, which is likely to see the proposed merger of T-Mobile and Sprint closing in the first half of 2019. 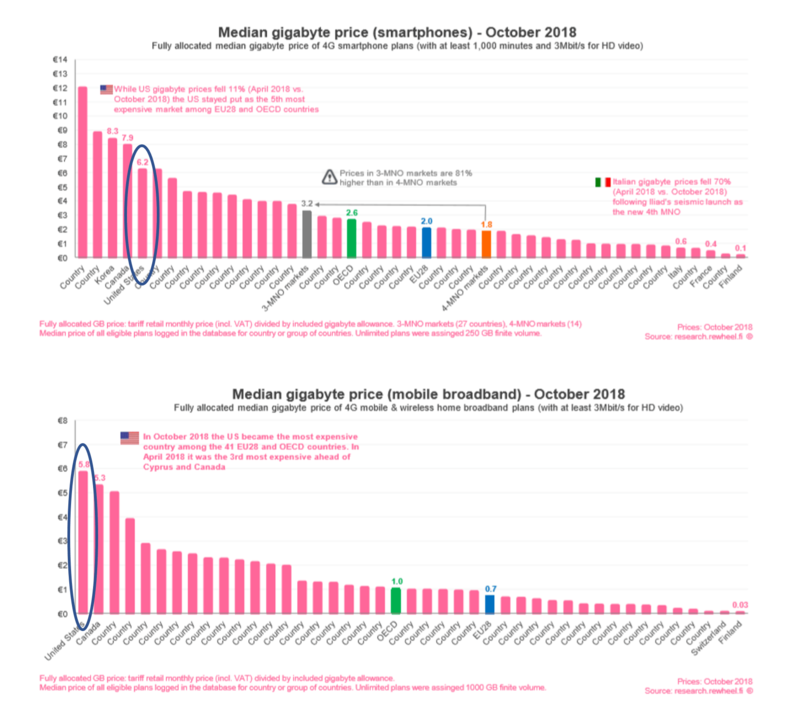 The report showed that among the 41 countries it analysed (OECD34 + EU28, with seven EU countries not being OECD members), the median gigabyte price of a smartphone deal (nominal price + VAT) in the US is among the highest. Rewheel told Telecoms.com that Greece and Cyprus topped the table, followed by Korea and Canada. The median gigabyte price of a mobile broadband deal in the US is the most expensive among all. The research compared two groups of markets, those with effectively four mobile operators and those with three. The mobile data price in the four-MNO markets is shown to be about half as expensive as the three-MNO markets, but the US is an outlier. The median US mobile data price per gigabyte is four times higher than the EU four-MNO markets, and sixteen times higher than the big EU markets with four MNOs. To look at it from another angle, a 30€ monthly deal comes with unlimited data plans (and at least 1000-minute talk time) on smartphones in 13 markets (Korea, Mexico, and 11 EU countries) but can only buy 6GB in the US. Similarly, a 30€ monthly wireless broadband deal can buy unlimited data in 11 EU markets but can only get 40GB in the US. The effect of the “magic four” driving price down is most telling in Italy: after Iliad launched its mobile service, the price per gigabyte fell by 70% in half a year. On the other hand, the research showed data price stopped falling in the Dutch market after the announced merger of T-Mobile and Tele2, and the price drop has visibly slowed down in Austria after it became a three-MNO market. The researcher therefore argued that the Americans are already paying more than other four-MNO market users, it could get even worse if the US market became a three-horse race. However we can see in the data that North America is generally more expensive, with Canada, a four-MNO market, is as expensive as the US. Admittedly though, Freedom Mobile is still weak. An additional angle to examine data price is to look at what is offered to contract users vs. prepaid users, which is excluded from the Rewheel research. The discrepancy is probably most obvious in Africa. According to the analysis published by the research firm Ovum, South Africa’s mobile data is among the highest in the world. This is largely down to the high prices PAYG users face when buying smaller data packages. Rob Shuter, the CEO of MTN, corroborated with his comments at the recent AfricaCom that, despite the average price per gigabyte for postpaid users in Africa is comparable to that of the US (around $3), data prices for prepaid users are prohibitive. The large majority of mobile users in Africa and other emerging markets are on prepaid services.